There's been a post going around Facebook about this amazing event: 5 planets visible in the same sky. It's pretty rare, but I think the pop social media crowd might be over estimating the excitement a little. Yes, all 5 naked-eye planets in our solar system are visible at the same time: Mercury, Venus, Mars, Saturn, and Jupiter. They present themselves in a nice arc across the sky, but they're not all in the same field of view - at least not with my lenses. 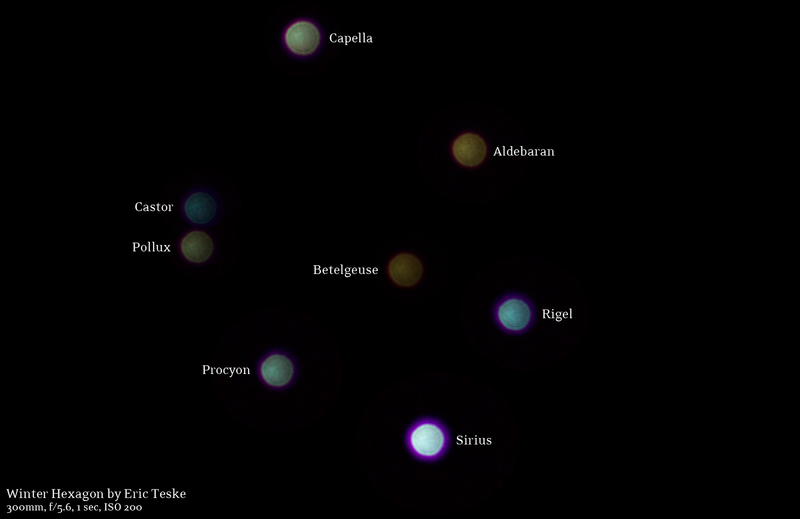 It's fun to imagine looking at the solar system side-on and all these planets in their respective orbits all on approximately the same side of the sun. But let's not get crazy. Anyway, I couldn't get a photo of them all at once. So my group of 4 is still my best planet family photo. But I did use the app Theodolite to help me spot Mercury. I wasn't sure if it was over the roofline yet so I looked up it's current position on StarWalk and then used Theodolite to see if that would be over the roof. I confirmed with binoculars. 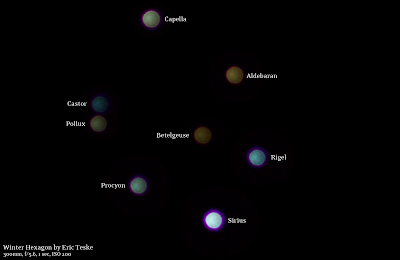 Theodolite and StarWalk are both on my top 13 astronomy and astrophotography app recommendations, so check them out! I can't believe another year has passed! I'm usually someone who gets tired of hobbies after 6 months and moves on, but it seems the challenge of astrophotography combines all my interests into something with real staying power. I've made incremental steps this year, witnessed some amazing nighttime displays, and continued to practice. It's been 4 years since I started playing around with night sky photos. I've turned each year into a gallery with my best, favorite, or most memorable photos [Year 1, Year 2, Year 3]. I think I'm reaching the upper limit of what I can do with my current gear. I think the next step is going to be some new glass or a reflecting telescope to gather more light. I'll give that a shot on the motor driven mount and see how frustrated I get before upgrading to a computerized mount. All in due time! I caught a traffic jam of planets in the morning before work. 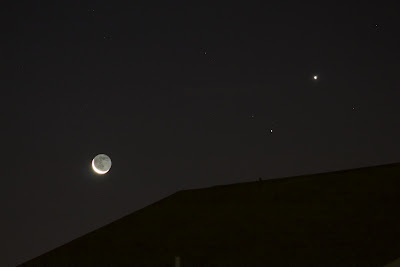 It was the most planets I caught in the same photo at once. 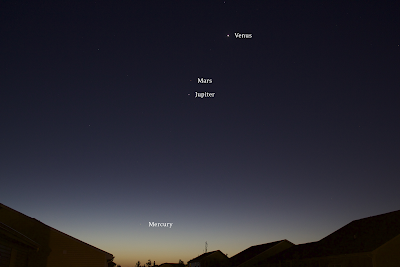 Always nice to see Mercury peaking up over the horizon. Although the conjunction wasn't exceptionally close, it was cool to ponder the shape of the solar system from this scene. 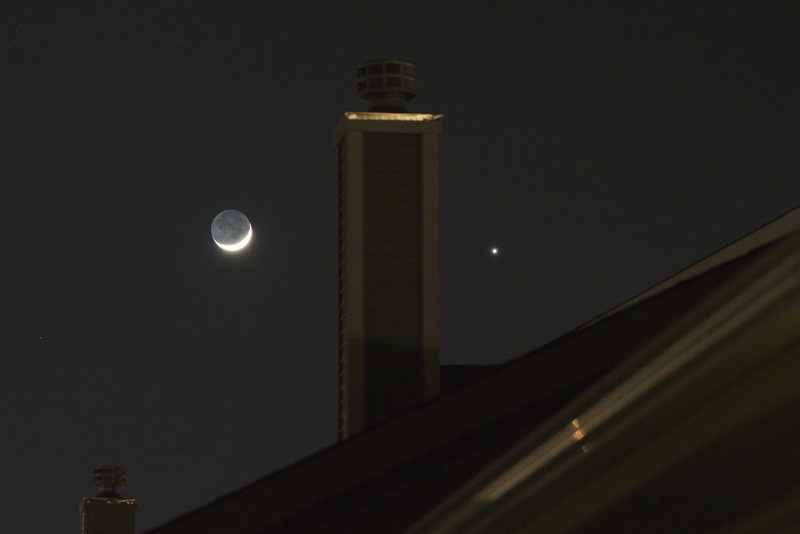 I called this photo 'celestial chimney sweeps' it was a fun twist on an otherwise ordinary conjunction between the moon and Venus. There's something about having foreground objects that make me love photos so much more. That's something I keep telling myself I'll work on, finding better composition. 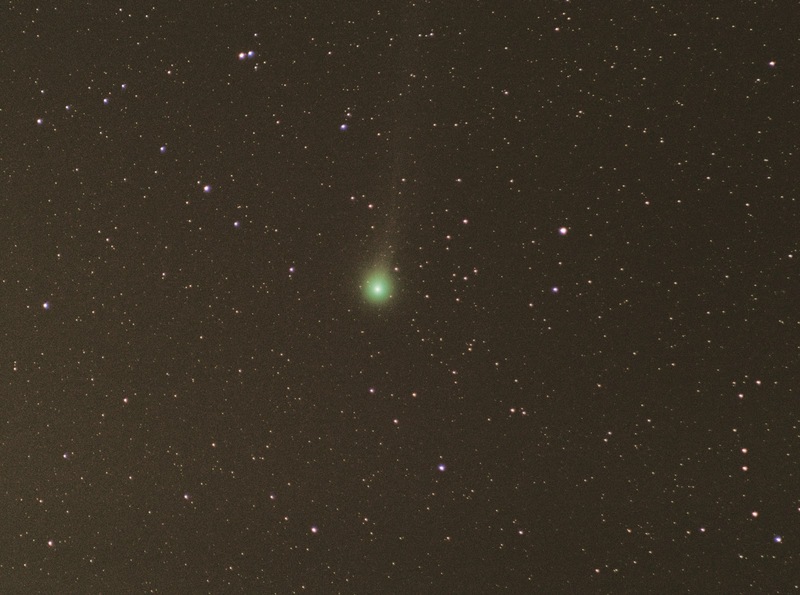 Comet Lovejoy from last year, only the 3rd comet I've photographed with a visible tail. I'm not sure why this same deep sky treatment didn't work on other comets, but either way I'm glad I got both color and a tail from a stacked image. The last boots to leave footprints on the moon. I love this photo and this artifact that marks an end to human activity on the moon. It's so sad and cool at the same time. I'm glad I got to spend some time at the museums in Washington DC while I was in town for a conference. It was lonely walking around by myself, but I got to take my time and read almost everything. 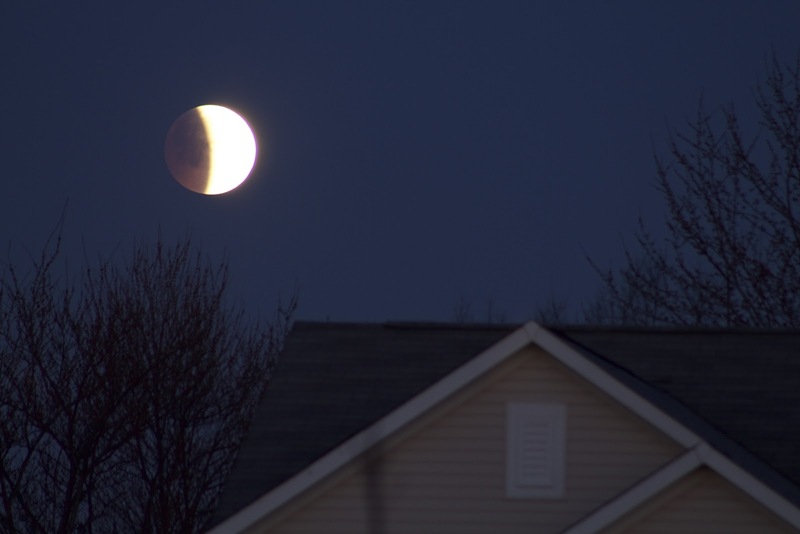 The April 2015 lunar eclipse was only partially visible from Indiana. I guess I shouldn't complain, I had clear enough skies to see two lunar eclipses in the same year. This was a fun morning because I chased the moon down the street to watch it after it went behind the houses in my backyard. 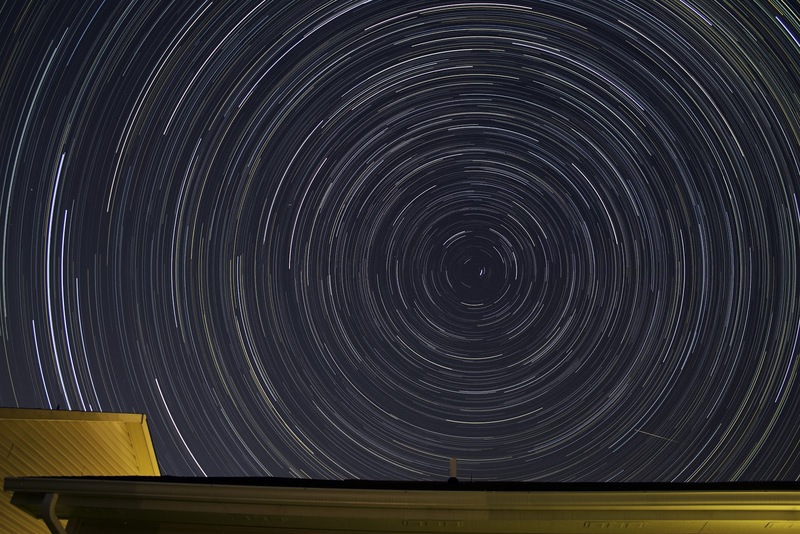 A really nice Perseid meteor and plenty of star trails. 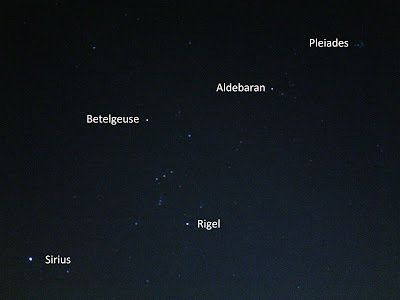 This was one of the first night sky events I caught after my mother in law let me borrow her lenses again. I caught a total of 8 meteors that night. 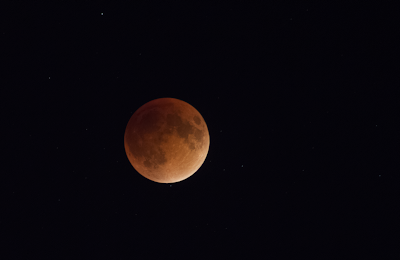 The September 2015 "super blood moon" a total lunar eclipse and supermoon at the same time. I was lucky to catch it between patches of haze. 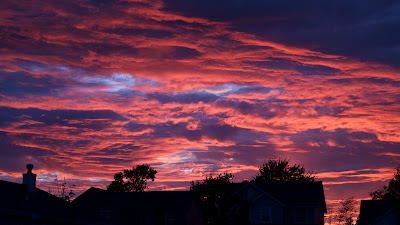 I didn't get the total sequence, but I was able to at least see it before the clouds rolled in. Lucky break on this one, but not the best atmospheric conditions for clean photos. 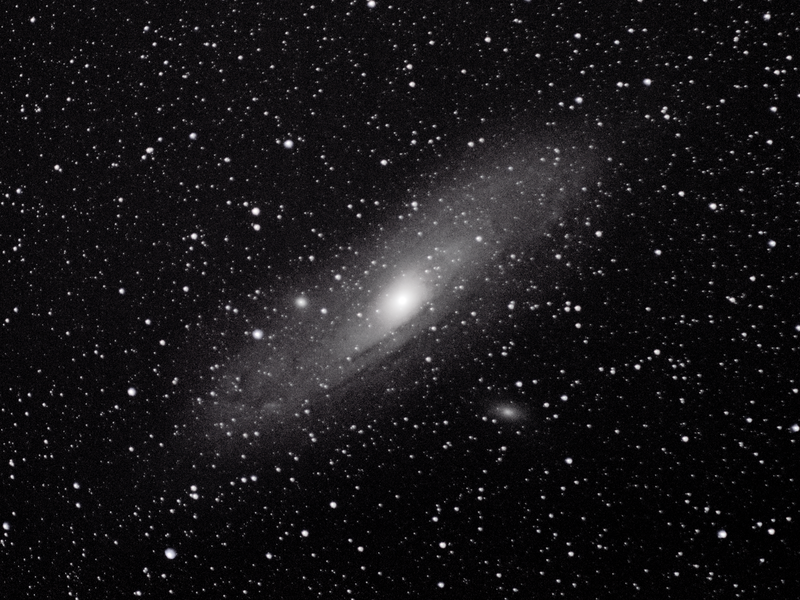 My personal best Andromeda and one of my only thorough-treatment deep sky photos of the year. I find that the more I know, and the more steps I add to my process, the less I go out. I guess that's just how it goes. 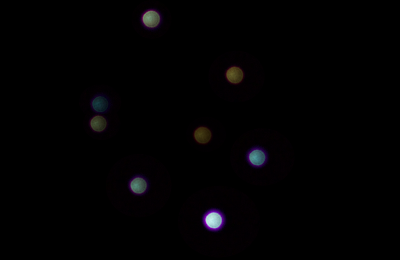 Nevertheless, this is an example of what my DSLR gear is capable of with my best effort. 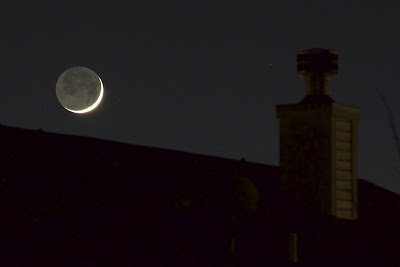 This shot of the crescent moon setting over my neighbor's roof with earthshine. I actually made a video sequence out of back to back shots to show the moon setting behind the roofline. 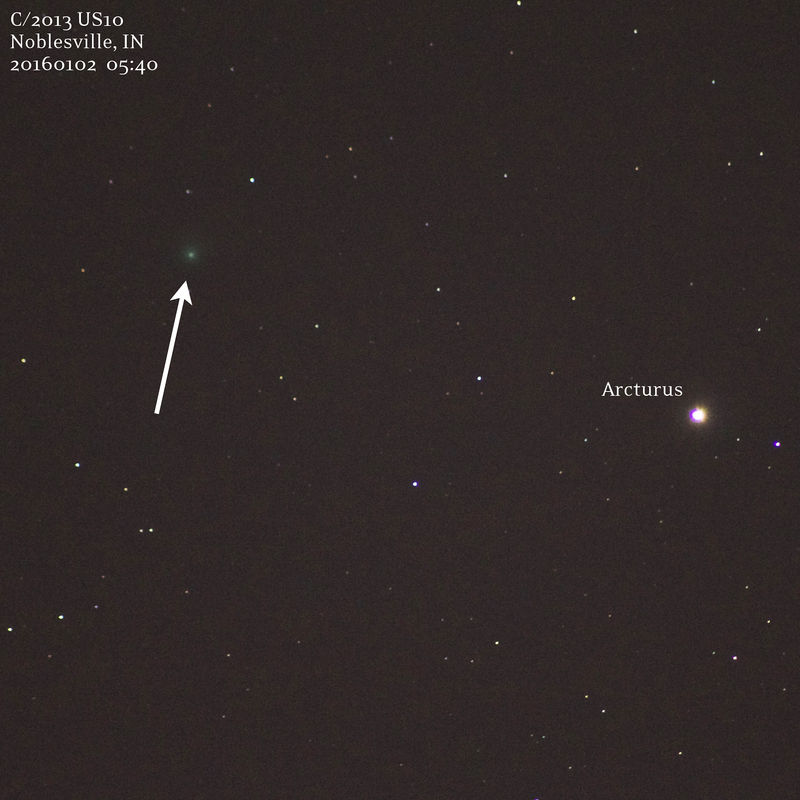 This GIF showing the movement and color of Comet Catalina. This was a fun night and I dabbled with a variety of media for this session. I did a timelapse of me setting up my gear, I did this GIF along with single frame photos, and I tried to do a thorough deep sky treatment but couldn't get much more than a fuzzy blob in the end. After a quick single frame of comet Catalina C/2013 US10 with my Canon T5i DSLR a couple weeks ago, I was hoping for clear skies to do a more thorough treatment. I woke up at 5:00am on January 2, 2016 and took my motor driven Orion EQ-1 mount out to the back patio. It was cold but not bone-chilling cold like some mornings, and we've had a mild winter so far this year. I did a rushed setup and got some pretty poor alignment, meaning I could only take up to 6 second exposures without star trails. I was feeling lazy so I figured 6 seconds was good enough and I didn't want to re-align everything. I was also battling the pre-dawn twilight, which would ruin my session in a couple hours. This YouTube video shows a timelapse of my setup, getting the Canon T5i on the Orion EQ mount. The Orion EQ-1 mount has an optional motorized attachment that will turn the camera/telescope to compensate for the rotation of the Earth. The motor does not track or lock on to anything, it just tries to turn at a constant rate. While this might be good for keeping your target in the field of view longer, it's not very smooth or precise. It's much better than a fixed tripod, however. Notice the amount of drift in the timelapse video at the end. My alignment was not great, but that should result in a constant drift in a single direction - not the shaking up and down motion we see. It looks like small variations in the motor speed are causing the mount to lag or speed up. The sequence at the end is 239 frames, each 6 second exposures at ISO 3200, f/5.6, 300mm with Canon T5i on January 2, 2016. If you look closely you can see the small fuzzy comet move slowly to the left relative to the star below it. 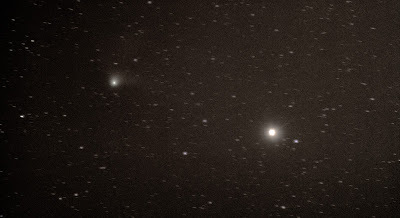 Comet photos with DSLR are tricky, especially with a very basic mount like this or even on a fixed tripod. Sometimes I get good results with stacking, and sometimes I like single frames better. I was really hoping to get some of this comet's tail, like I did with comet Lovejoy last year, but 6 seconds was just not enough. 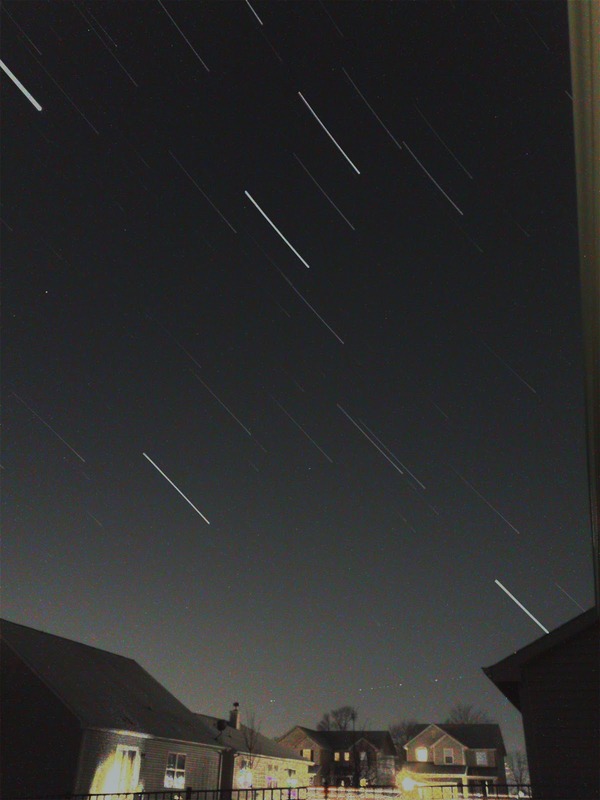 While taking over 230 individual photos, each at 6 seconds long, the comet moved a noticeable amount. This thing is moving quick! It becomes more obvious when you look at the first and last frame I took that morning. Here is an animated GIF showing the earliest and latest frame from my stack to show the change in position. This was also my first time stacking a comet photo in Deep Sky Stacker with comet mode, attempting to register the position of the comet to hold it constant and let the stars trail in the background. 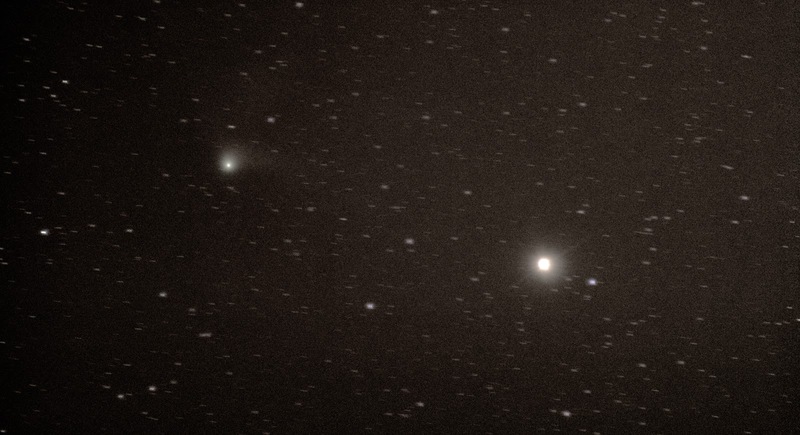 Because the comet moved quite a few pixels across the field of view relative to the background stars, I was hoping this painstaking process would pay off with a nice comet tail. In Deep Sky Stacker, you literally have to go in and click on the comet in every single light frame to teach the program where the comet is. This maybe isn't so bad if you have 6x 5 minutes exposures or something, but I had over 200x 6 second exposures. Ugh! I gave it the ol' college try to see what it would do, and I was underwhelmed. 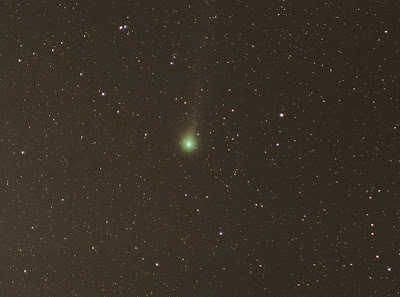 After about 2 hours of pin-pointing the comet in sub frames and another 2 hours of stacking, the image below is what I got out of it. 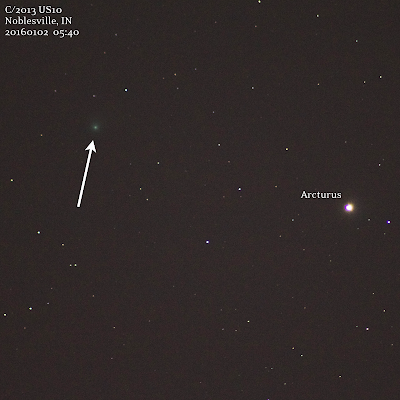 You can see comet Catalina to the left and bright Arcturus to the right. 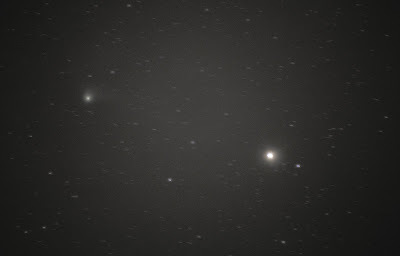 All of the stars are trailing and the comet is supposed to appear stationary in this kind of stacking. I forgot flat frames and I have a massive gradient hot spot in the middle of the image. I'm going to try re-stacking with my ISO 1600 flat frames and see if they're close enough to do the job. I've been using the same flats for just about every stacked photo, I'm so bad! Here is another process with flat frames - do I see a hint of a blobby tail coming off to the right or is that my imagination? Honestly, I like the look of the single frames better. The stars are around and the comet has color. I just should have spent more time on the set up and gotten longer exposures!! It's always fun to take a stack of photos for star trails, and with comet mode in StarStaX there are a lot more things you can do with these files than simply make a stack. I might even go back and use some stacks I took before to turn them into comet trail animation videos like the one below. It's very easy, you just click a box to save each iteration of the process and then dump those files into video software to use them as movie frames. Here are the results of 243 individual frames in the backyard. I didn't bother removing any of the airplanes or satellites, and didn't do any color correction. Usually it's nice to tint it a little toward the blue side, increase contrast a bit, and remove all of the airplane light trails before stacking. But I'm not going to get a print of this so it's fine for now. What I really wanted to show you was the resulting video using comet trails in StarStaX. It slowly fades out the frames after they appear, meaning the airplane trails don't stick around as long. 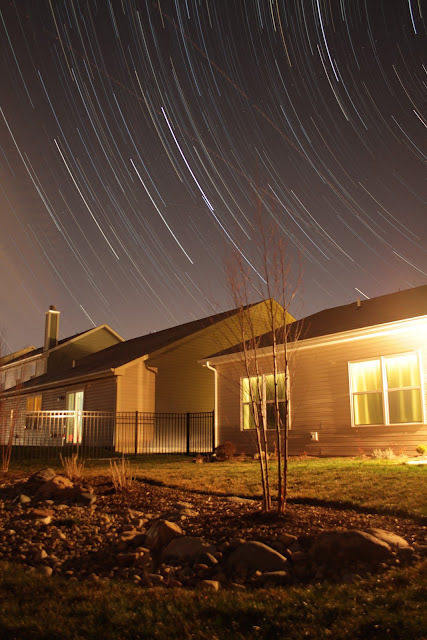 Also the light pollution from the houses go off like flashes instead of sticking around. On a side note, there aren't a lot of good ways to show vertical videos online. Definitely not on YouTube, so I am trying to embed this Instagram file. It's lower resolution, but it's preferable to having two huge black bars on the side of the video. Not a bad solution for a quick post! Say! That turned out better than I thought! 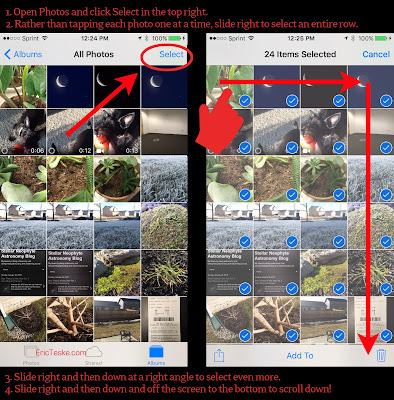 I think Instagram makes a great go-to solution for posting vertical videos on webpages! 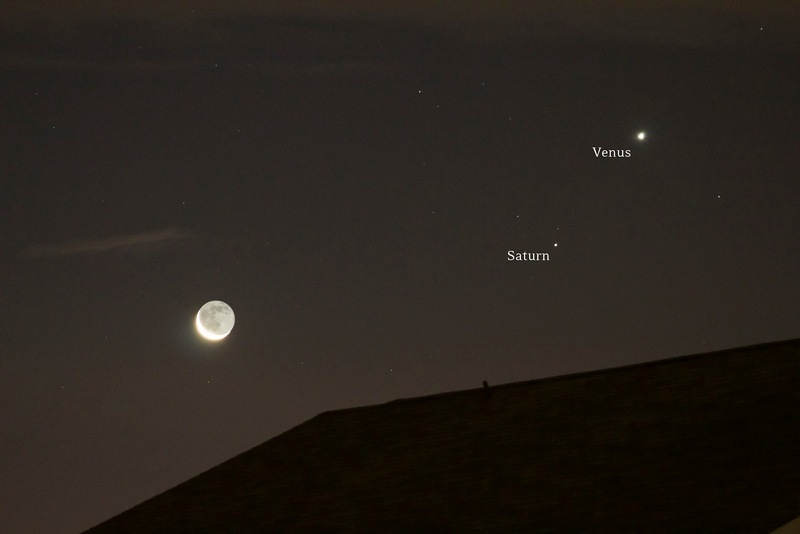 I woke up to a great collection of Venus and Saturn in a fairly close pairing alongside the 7.6% crescent moon on Thursday, January 7, 2016. There wasn't much foreground scenery to speak of - just my neighbor's roofline - but the collection looked cool floating over the houses in the cool morning air. The clear sky was a welcomed sight since we've been having a very rainy winter so far. The bright grouping looked like a nice target to try some iPhone photos, so I got out my tripod and adapter and used both the default camera app and Night Cap Pro. Night Cap Pro is great for low light, but the moon and Venus were very bright in this shot. I do like how Night Cap Pro was able to show some scenery with the houses rather than just the moon and Venus. This is a comparison of the DSLR photo (above) to the iPhone 6 with default camera app (bottom) at f/2.2, 4.2mm, ISO 2000, 1/15 sec showing the crescent moon with earthshine, Saturn, and Venus clearly visible. Between the two, I like the wider photo with houses for context even though the moon isn't properly exposed and turns into a large white blob. It's kinda cool. It looks like glowing orbs, UFOs, or just a huge star above the house. I try not to post too many photos straight out of the iPhone to Instagram because I know that they're just blobs - I get it - but it's fun to play with and test out what the iPhone camera is capable of without any fancy gadgets or attachments.